Learn about Meteorites | How to Identify a Meteorite - The Meteorite Exchange, Inc.
Meteorite Definition: A meteorite is a fragment of rock or iron from a meteoroid, asteroid, or possibly a comet which passes through a planet or moon's atmosphere and survives the impact with the ground. Most meteorites originate from larger asteroid bodies orbiting the Sun in the asteroid belt between Mars and Jupiter. Collisions and gravitational interactions between asteroids can send smaller pieces into the inner solar system where they can intersect with Earth's orbit to become part of the thousands of meteorites that fall to earth. The Earth collides with thousands of small pieces of this material from outer space producing the sporadic shooting stars and fireball meteors seen at night. Several larger meteoroids collide with the Earth every day with some landing in the oceans and others on land. Can you buy meteorites for sale? Think you may have found a meteorite? Yes, you can legally purchase a meteorite for sale and collecting them is a fun and fascinating hobby. They are scientifically interesting and many have amazing stories attached to them. There are many different ways to start collecting. We recommend starting small with a broad focus and then you can become more narrowly focused on which specimens to buy as your expertise grows. A meteor is the streak of light we see at night as a small meteoroid burns up passing through our atmosphere. A fireball is a very bright meteor and may actually break up and drop meteorites. Meteors and fireballs are commonly referred to as shooting stars. In addition, each year the Earth passes through the orbits of comets and the dust from these comets produce a meteor shower. Meteor showers happen as tiny bits of material from dust size to the size of a grain of wheat. They burn up almost completely high in the atmosphere dozens of miles above the Earth's surface. It's important to note that some people call these events meteorite showers but this is not accurate as meteor shows do not produce meteorites. There are three basic types of meteorites, the irons, stony, and the stony-irons. Each of these basic families has subgroups. The iron group is nearly solid nickel-iron metal. Because of the strength of the metal, some of the largest individuals recovered are iron. Also many of the craters formed by iron meteorites because the asteroids survived without breaking up all the way to the ground. Magnets strongly attract Iron meteorites which look like real metal when you grind a spot off their surface. They show a pattern when etched by chemicals because of the different nickel-iron minerals composing them. A chondrite meteorite is a rock from space that contains small spherical structures called chondrules. These are droplets of melted rock which cooled in microgravity into tiny spheres. The chondrules clumped up and through accretion formed into larger masses, finally becoming asteroid-size bodies from which broken off chunks have made it to Earth. All meteorites contain the same elements as here on Earth but new minerals form because the processes of rock creation in space are quite different from those on Earth. The elements are able to combine to form some minerals not found in terrestrial rocks. However, most of the minerals in meteorites are those that make up terrestrial rocks as well. Most chondrites have nickel-iron metal in them. The metal can be as little as a few percents to as much as twenty-five percent or more. The tiny chondrules of chondrites hold together by finer grain particles that form a matrix. Heat from various sources has liquefied the chondrules and particles into rock, and heat can also alter the meteorite's character over time. Achondrites are stone meteorites that do not have chondrules. If you heat a achondrite meteorite until it completely melts and then let it coll and recrystallize, it will leave no trace of the chondrite structure. Another way they form as rocks on larger bodies with sufficient size to squeeze and melt the rocks. This is what occurs at depths in the Earth creating our igneous rocks. The achondrites like the chondrites can have iron metal in them. The achondrite subgroups of the Howardites, Eucrites, and Diogenites may be from the large asteroid Vesta. The planetary achondrites are meteorites that have come from the Moon and Mars. We recognize lunar meteorites because of their similarity to the Moon rocks returned to Earth by the Apollo astronauts. The Martian meteorites have small amounts of trapped gas that matches the gases in the Mars atmosphere. Someday we may find space rocks from the other rocky planets of the inner solar system. We may even identify some that are pieces of the Earth due to impacts from long ago. These would likely be the hardest to identify since only by examining the fusion crust or someone seeing them fall would distinguish them from normal Earth rock outside a laboratory. The stony-irons are a mixture of nearly 50% rock and 50% nickel-iron metal. 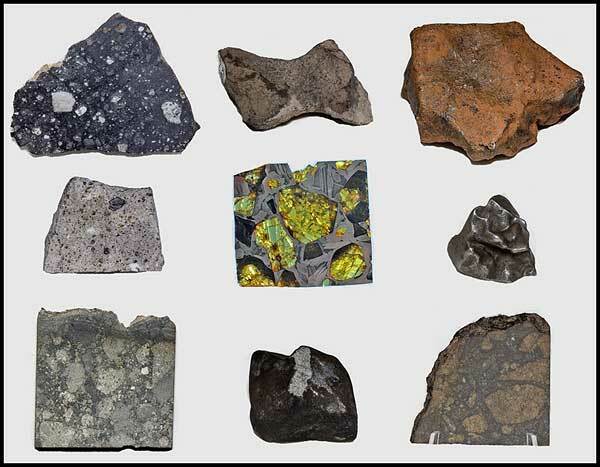 The two subgroups of the stony-iron meteorites are the pallasites, which contain olivine crystals as the rock component, and the mesosiderites which contain various silicate minerals as the rock portion. In both of these types, the metal portion completely surrounds the rock portion. In other words, the metal is not in veins or isolated chunks but as the matrix enclosing the mineral half of the mass. The stony-iron family is the rarest of the three main groups and they are among some of the most beautiful of all the meteorites. A Colorado based company offering meteorite identification services called Geo Labs is a good place to start if you want to find out for sure. For about a hundred dollars they offer XRF analysis services for the specific purpose of meteorite identification. They use state of the art X-Ray Fluorescence technology to determine elemental compositions of a sample. Geo Labs is a good option for the first stage of the meteorite identification process. They can also assist with the more rigorous analysis and classification processes leading to publication in the Meteoritical Bulletin. Meteorites are the rarest types of rock on Earth. People send thousands of rocks to laboratories each year by individuals thinking that they found a meteorite. At best only one or two of these thousands is actually a rock from space. This article teaches people the basic characteristics of how to identify a meteorite. This guide provides simple at home tests that can help the reader to make a better determination if their rock is truly a space rock, or one of many terrestrial rocks known as meteor-wrongs. The pictures in the section below will help answer the question of what do meteorites look like. All meteorites fall through the atmosphere at such high velocity that material burns off their exterior. This melting leaves a glassy outer coating called a fusion crust. The fusion crust is usually a dark gray to charcoal black in color. Black fusion crust can be shiny or a dull velvety texture. The fusion crust can have lines and flow marks from the movement of the molten rock across the surface. It is very common for meteorites, even fresh ones, to have a fusion crust with chips. Over time with weathering very little of the fusion crust may remain. Can You Tell Which Stone Has Fusion Crust? This is not fusion crust. This is a black dolomite pebble. Dark gray to black stones are common to find on dry lake beds, and many have smooth pits and facets from the effects of the wind and chemical erosion. Yes! This is an example of fusion crust from a Chelyabinsk Meteorite. This is the typical appearance of fresh chondrite fusion crust. Meteorites are not round balls, and most have irregular shapes. They are often angular with rounded off corners. Some show pits on their surface which we call thumbprints. Scientists call these marks regmaglypts, and they form as hot air currents erode the rock as it plunges through the atmosphere. People often find old rusty iron masses and confuse them for meteorites. Cannonballs and mill balls are often the sources of these meteor-wrongs. These rusty objects have an iron meteorite appearance, and chemical testing can help determine if they are man-made. The iron in meteorites is a nickel alloy and if the rock does not contain nickel, it is not an iron meteorite. Can You Tell Which Stone Has a Meteorite Shape? Yes! This is a Gibeon Iron Meteorite. Note the chunky and pointy shape; it is not spherical and it strongly attracts to a magnet. Irons may be covered with a flaky layer of iron shale on the surface. This is not a meteorite. This is a piece of man-made iron. By testing for nickel-iron, you can determine if the object is a true meteorite or a meteor-wrong. Yes! This is a stone Gao Meteorite. Note the block shape with smooth rounded corners. The fusion crust is mostly still black, but some spots of brown are appearing with age. Contraction cracks can be seen in the fusion crust. It is domed and more round than some because it is an oriented meteorite that fell through the atmosphere in stable flight causing melting on only one side. Yes! This is an Agoudal Meteorite. Note the thumb printed surface, unusual shape, and weathered appearance. Will be strongly attracted by magnet because it contains iron. The slag from industrial processes of manufacturing iron and steel can have metallic particles in it. Slag is one of the materials that is often confused for meteorites. This slag, however, will usually be porous or even bubbly which is a clue that it is not a real space rock. Meteorites, in some cases, may exhibit vesicles, but they are not porous or bubbly in appearance. Meteorites are solid rocks and may have pits on their surface, but inside they are dense. Volcanic rocks, basalts, and lavas are porous and are often mistaken for space rocks. No, this is black lava. This is a porous lava rock which is very common to find in the desert. Black lava is black throughout. Meteorites are not normally completely black. Very small and lightweight pieces of lava rocks may stick weakly to a magnet, but whole rocks will not hold a magnet. No, this is Limestone Rock. Black limestone with a naturally etched surface texture. Will not react to a magnet at all. Similar textured rocks are commonly seen on dry lake beds. When meteorites are fresh, they are often black, and their fusion crusts may show flow lines and details that can help in identification. After a long time on the ground, they can change color, and fusion crusts wear away, and details disappear. The iron in meteorites just like iron in tools rusts from being out in the weather. As the iron metal rusts, it stains the inside rock matrix and the outside surface. Starting as spots of red or orange on the black fusion crust as time goes on the whole stone will become rusty brown colored. The fusion crust will often still be visible but no longer black. Can You Tell Which Stones Are Meteorites by their Color? Yes! This is a real meteorite named Nuevo Mercurio. It is an H5 chondrite and will be strongly attracted to a magnet. It was a witnessed fall, and many specimens are fresh with black fusion crust. Yes! This is a genuine meteorite, and the red color is from rusting metal coming through the fusion crust. It has an irregular shape and rounded off corners. It is slightly weathered from years on Earth but has not begun to crack apart. No. This Is Not a Meteorite. This stone is Brown Basalt. Basalts are igneous rocks that are found in many colors and are everywhere in the desert. They are usually porous though this one is not very porous. They can occasionally be slightly responsive to a magnet. No, this is not a meteorite. It is a red and black slate type rock, there is no response to a magnet. Sometimes the red of rocks resembles the rust spots on real space rocks. Meteorites are generally heavier than earth rocks of the same size. This is because of the metallic iron that most of them contain. Many meteorite hunters carry a diamond file with them to grind a small spot off rocks to see if there are any iron grains inside. With only a few rare exceptions metallic iron metal is not found in earth rocks. During eons of erosion and weathering, the iron in earth rocks is now in mineral form, and not metallic. The metal found in meteorites will be shiny and look like chrome. The appearance of the metal will not be a shiny gray sheen, that is often seen on some Earth rocks. Iron metal grains in rocks can also look like a space rock and are good indicators. However, there are more tests and many other factors to take into consideration. The vast majority of meteorites contain some metallic iron while others are mostly solid iron. This iron makes most space rocks responsive to a magnet. Many stone meteorites will hold a strong magnet placed on them even if they are of a low iron type. This magnet test is one of the first simple tests that can be done at home or in the field. Rare earth magnets are inexpensive, and available from many sources, and they are the best for this test. But, there are earth rocks that also will hold a magnet and to make matters worse they are quite common. The two most often misidentified rocks are those that contain the minerals hematite and magnetite. These rocks can sometimes also look a little like meteorites, and other simple tests can rule these rocks out. Both Magnets Stick. Which One Is The Meteorite? No. This is Hematite. Some pieces of Hematite are not responsive to a magnet, and some are. Hematite nodules can resemble actual meteorites and are among the most commonly misidentified stones. Yes! This is a real meteorite. Many stone types and of course all iron meteorites will respond to a magnet. Even low metal chondrites will stick to a rare earth magnet. Some achondrites contain so little iron however that they will not respond to a magnet. It is a common practice in geology to rub a mineral or rock across a streak test plate and observe the color of the mineral powder line that is made. This is very useful for examining suspect space rocks as well. Meteorites will give a brown streak when rubbed on a test plate. The two most commonly misidentified rocks as mentioned earlier are magnetite and hematite. The streak color of hematite is a dark red. In fact, the coloring for rouge used in cosmetics was derived from crushed hematite. The streak color of magnetite is black. So even though the stone is responsive to a magnet, the mineral's streak and lack of actual metal will reveal that it is terrestrial. You do not need to obtain an actual testing plate to make the streak. The non-glazed back side of a white ceramic tile will work fine for the test and can be obtained inexpensively. Which File Shows The Correct Color Streak? This is a Hematite streak and not a meteorite streak. Since the dawn of man's history, the red powder of hematite has been used as a pigment by humans. Although the rock may be dark brown or grey on the exterior, the powder when ground up will be red. The picture shows a diamond file has been used to test a piece of rock. Yes, this is a real meteorite streak. Many stone meteorites will usually produce a brown color when ground off with a diamond file or tested on a streak plate. The largest group of space rocks is the chondrite type of stone meteorite, and they contain nickel-iron metal in the form of tiny grains scattered throughout the matrix of the rock. There are man-made rock-like materials such as slags that may have bits of metal, but they will not have a solid rock-like appearance. If the stone is fresh and has a nice fusion crust it may not be desirable or even necessary to cut or grind off a spot to look for metal grains as the appearance of the fusion crust may be enough evidence of its cosmic origin. But, for example, if the stone is an old desert rock that is brown and meteorite like in appearance, you can first grind away a spot with a diamond file. Then, using a hand lens, look for metal grains to help determine if it is a space rock. Because the grains are made of iron and can rust, it is common for them to be altered, or somewhat absent in old weathered stone meteorites. Very old chondrite stones will still reveal some metal grains upon careful inspection. If you think it is a meteorite and you see no metal grains on the small spot you grind with a diamond file, it is a good idea to bring the stone home and do more tests. A small number of stone meteorites produce a gray powder when you grind them, and it is wise to bring these suspects home as well for further testing if they have other identifying characteristics. Which Stone Contains Metal Grains? There are no metal grains in the picture so, therefore, it is not a meteorite. While not all meteorites have metal grains, most do. Along with other negative factors, the lack of any grains of nickel-iron is evidence that a stone may be of terrestrial origin. Yes! This is a meteorite with iron grains showing in the picture. The majority of stone meteorites will show some nickel-iron grains when you grind a spot on them. These metal grains will look like bright spots with the appearance of the chrome on a car. They will not be just a sort of metallic sheen. Nothing is more important in learning to identify meteorites than seeing many images of real space rocks. Over thousands of years of weathering on Earth's meteorites change so much it can become hard to recognize them. Fresh meteorites have a lot more clues to help in their recognition. We have many images on our site that can help familiarize the reader with how true meteorites look. Real space rocks are found every year by hikers and hunters and others who spend time out of the city. But, the vast majority of rocks thought to be meteorites are in fact earth rocks. Learning the characteristics of identifying meteorites is a challenging task, but it can be accomplished with a little study.